For your good health. Always. Bell's palsy/Facial palsy is a form of facial paralysis resulting from damage to the 7th cranial nerve. Bell's palsy gets its name from the 19th century Scottish surgeon, Sir Charles Bell, who was the first to describe the condition ("Palsy" is an archaic (old) word which means paralysis). Bell's Palsy is the most common cause of facial paralysis in the world. The condition afflicts around 40,000 Americans each year. The incidence rate in the US is around 20 - 30 cases per 100,000 of the population. Worldwide, Bell's Palsy afflicts approximately 10 - 30 people per 100,000 of the population. The 7th cranial nerve is mixed nerve containing both sensory and motor components. It emerges from the brainstem between the pons and the medulla, and controls the muscles of facial expression, and functions in the conveyance of taste sensations from the anterior two-thirds of the tongue and oral cavity. 7th cranial nerve also supplies preganglionic parasympathetic fibers to several head and neck ganglia. The motor part of the 7th cranial nerve arises from the facial nerve nucleus in the pons while the sensory part of the 7th cranial nerve arises from the nervus intermedius. The motor part and sensory part of the 7th cranial nerve enters the petrous temporal bone into the internal auditory meatus (intimately close to the inner ear) then runs a tortuous course (including two tight turns) through the facial canal, emerges from thestylomastoid foramen and passes through the parotid gland, where it divides into five major branches. Though it passes through the parotid gland, it does not innervate the gland (This is the responsibility of cranial nerve IX, the glossopharyngeal nerve). The 7th cranial nerve forms the geniculate ganglion prior to entering the facial canal. Nerve to stapedius - provides motor innervation for stapedius muscle in middle ear. Posterior auricular nerve - controls movements of some of the scalp muscles around the ear. Branch to Posterior belly of Digastric and Stylohyoid muscle. Temporal (frontal) branch of the 7th cranial nerve. Zygomatic branch of the 7th cranial nerve. 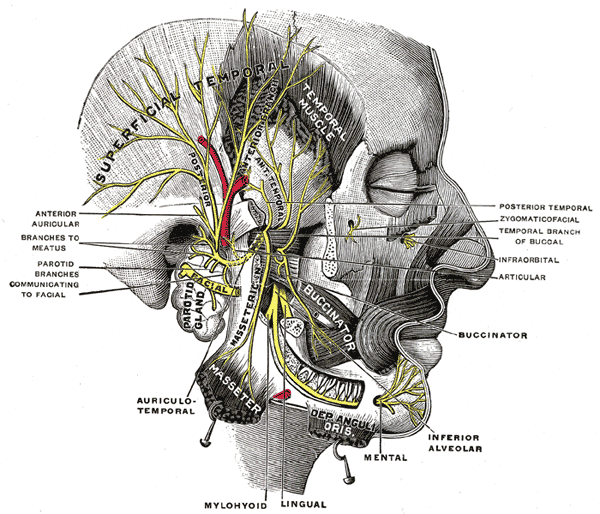 Buccal branch of the 7th cranial nerve. Marginal mandibular branch of the 7th cranial nerve. Cervical branch of the 7th cranial nerve. Its main function is motor control of most of the muscles of facial expression. It also innervates the posterior belly of the digastric muscle, the stylohyoid muscle, and the stapedius muscle of the middle ear. All of these muscles are striated muscles of branchiomeric origin developing from the 2nd pharyngeal arch. The 7th cranial nerve also supplies parasympathetic fibers to the submandibular gland and sublingual glands via chorda tympani. Parasympathetic innervation serves to increase the flow of saliva from these glands. It also supplies parasympathetic innervation to the nasal mucosa and the lacrimal gland via the pterygopalatine ganglion.The 7th cranial nerve also functions as the efferent limb of the corneal reflex and the blink reflex. In addition, it receives taste sensations from the anterior two-thirds of the tongue via the chorda tympani, taste sensation is sent to the gustatory portion of the solitary nucleus. General sensation from the anterior two-thirds of tongue are supplied by afferent fibers of the third division of the fifth cranial nerve. These sensory and taste (VII) fibers travel together as the lingual nerve briefly before the chorda tympani leaves the lingual Nerve to enter the middle temporal fossa via the petrotympanic fissure. It thus joins the rest of the 7th cranial nerve in the internal acoustic meatus before synapsing in the solitary nucleus. The cell bodies of the Chorda tympani reside in the geniculate ganglion, and these parasympathetic fibers synapse at the submandibular ganglion, attached To the lingual nerve. The 7th cranial nerve also supplies a small amount of afferent innervation to the oropharynx below the palatine tonsil. There is also a small amount of cutaneous sensation carried by the nervus intermedius from the skin in and around the auricle (earlobe). The cell bodies for the 7th cranial nerve are grouped in anatomical areas called nuclei or ganglia. The cell bodies for the afferent nerves are found in the geniculate ganglion for taste sensation. The cell bodies for muscular efferent nerves are found in the facial motor nucleus whereas the cell bodies for the parasympathetic efferent nerves are found in the superior salivatory nucleus. Voluntary facial movements, such as wrinkling the brow, showing teeth, frowning, closing the eyes tightly (inability to do so is called lagophthalmos) , pursing the lips and puffing out the cheeks, all test the facial nerve. There should be no noticeable asymmetry. In an UMN lesion, called central seven, only the lower part of the face on the contralateral side will be affected, due to the bilateral control to the upper facial muscles (frontalis and orbicularis oculi). Lower motor neuron lesions can result in a 7th cranial nerve palsy (Bell's palsy is the term used to describe the idiopathic form of facial nerve palsy), manifested as both upper and lower facial weakness on the same side of the lesion. Taste can be tested on the anterior 2/3 of the tongue. This can be tested with a swab dipped in a flavoured solution, or with electronic stimulation (similar to putting your tongue on a battery). Corneal reflex. The afferent arc is mediated by the General Sensory afferents of the Trigeminal Nerve. The efferent arc occurs via the Facial Nerve. The reflex involves consensual blinking of both eyes in response to stimulation of one eye. This is due to the Facial Nerve's innervation of the muscles of facial expression, namely Orbicularis Oculi, responsible for blinking. Thus, the corneal reflex effectively tests the proper functioning of both Cranial Nerves V and VII. The etiology of this form of facial nerve palsy is unknown and therefore exactly what causes this damage is also unknown. Many scientists believe that a viral infection such the common cold sore virus, herpes simplex, causes the disorder. It is thought that the 7th Cranial nerve (VII), which supplies the face, swells and becomes inflamed in reaction to an infection, causing pressure within the Fallopian canal, the narrow 'tunnel' in the skull through which the facial nerve passes in a somewhat tortuous route. As the nerve swells, it compresses against the inside of the Fallopian canal and as a result, the nerve is unable to function. 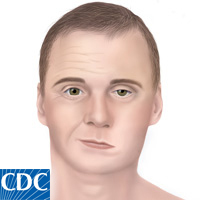 Bell's Palsy has also been associated with herpes, mumps, influenza or a flu-like illness, headaches, chronic middle ear infection, high blood pressure, diabetes, tumors, Lyme disease, tuberculosis, trauma such as skull fracture, facial injury and even in some instances, dental work, if the facial nerve is damaged or frozen during injection. During pregnancy, Bell's palsy is sometimes associated with pre-eclampsia, a condition that affects women at an advanced stage of pregnancy, noted by high blood pressure, swelling of the ankles and protein in the urine. Bell's palsy is also more rarely associated with serious neurological conditions such as Guillain-Barre syndrome, neurosarcoidosis and multiple sclerosis. Bell's palsy is more common in pregnant women than in women who are not pregnant. Developing Bell's Palsy during pregnancy does not automatically indicate the presence of a more serious underlying condition. High blood pressure, diabetes, influenza or flu-like illness, middle ear infection and dental work, have all been associated with Bell's Palsy. During pregnancy, Bell's palsy is sometimes associated with pre-eclampsia, a condition that affects women at an advanced stage of pregnancy, noted by high blood pressure, swelling of the ankles and protein in the urine. This possibility should be investigated by the physician. Pre-eclampsia is a serious condition and careful management is required should this be the case. The condition, Bell's Palsy, poses no risk to the unborn infant, however it should always be investigated to eliminate any underlying conditions. Often, no treatment is needed. Symptoms often begin to improve right away. However, it may take weeks or even months for the muscles to get stronger, and this may be frustrating. Your health care provider may give you lubricating eye drops or eye ointments to keep the surface of the eye moist if you cannot close it completely. You may need to wear an eye patch while you sleep. Sometimes medicines may be used, but it is not clear how much they help. If medicines are used, they should be started right away. Surgery to relieve pressure on the nerve (decompression surgery) is controversial and has not been shown to routinely benefit people with Bell's palsy. Patients most often chose facial exercises as their main form of physiotherapy treatment for Bell's Palsy. Facial muscles atrophy very slowly, so you do not need to exercise to maintain muscles as you would for a broken arm or leg. Instead, you will use facial exercises to keep your brain trained in what electrical impulses are needed to control the different muscles in your face. This will help you transition back to using your facial muscles as you recover from Bell's Palsy and the paralysis goes away. Facial exercises for Bell's Palsy involve doing basic actions with the different muscle groups throughout your face. If you are seeing a doctor or physical therapist for your Bell's Palsy, he will be able to recommend specific exercises appropriate for your level of paralysis. If not, try thinking about the different muscles in your face, and exercising them from top to bottom. Furrow your brow, raise your eyebrows, slowly blink your eyes, and continue down to your chin. When performing these exercises, you should not exert yourself or worry much about whether you are successfully completing all of them. Instead perform the exercises with an ability that matches your natural recovery from Bell's Palsy. Remember that the exercises are intended to work your mind more than they are intended to work your muscles. Facial exercises can be preformed at home. You should go through the exercises three times each day. EMG feedback and/or specific mirror exercises will provide a sensory feedback to promote learning. When each muscle group is being assessed, the patient observes the action of these muscles in the mirror and instructed to perform small symmetrical specific movements on the sound side to identify the right response. Each patient presents with different functional disability, so there are no general list of exercises. As patient identifies the specific area of dysfunction, patient can begin to perform exercise to improve facial movements' guided by the affected side so isolated muscle response is preserved and coordination improved. Repetitions & frequency of exercises can be modified according to improvement status. Synkinesis: The site of synkinesis should be identified in order to teach the patient how to control abnormal movement pattern. The treatment of synkinesis depends on inhibition of the unwanted movements that occur during volitional & spontaneous movements; by perform facial movement slowly without triggering the abnormal movement. Stretching is recommended here to prevent muscles tightness. Some doctors recommend using electrical stimulation and biofeedback as an additional method of physiotherapy for Bell's Palsy, but other doctors believe that it does little to help recovery. Decide with your doctor or therapist whether electrical stimulation is right for you. Unlike facial exercises which you mostly perform at home, you will need to visit a therapist for electrical stimulation. Electrical stimulation uses small amounts of electricity to activate the muscles in your face. This causes your muscles to twitch as if electrical impulses from your brain activated them. During the stages of Bell's Palsy when your face is most paralyzed, this may be the only way for you to activate these facial muscles. Kabat rehabilitation is type of motor control rehabilitation technique based on proprioceptive neuromuscular facilitation (PNF). During Kabat, therapist facilitate the voluntary contraction of the impaired muscle by applying a global stretching then resistance to the entire muscular section and motivate action by verbal input and manual contact. When performing Kabat, 3 regional are considered: the upper (forehead and eyes), intermediate (nose), and lower (mouth). Prior to Kabat, ice stimulation has to perform to a specific muscular group, in order to increase its contractile power. Excess drying of the eye surface, leading to eye ulcers or infections. The main concern is to ensure the eye is protected and is kept moistened. At night-time, it is probably best to use a soft, surgical, eye patch, taped to ensure the eye remains closed during sleep. A small piece of lightly adhesive surgical tape on the eyelid itself may also be required. It is recommended that an eye patch be worn to prevent corneal erosion or other eye damage. During the day, when an eye patch is perhaps an inconvenience, although not recommended, the eyelid of the affected eye can be manually closed and 'blinked' several times. This is best done by use of soft, clean, tissues to gently close the eyelid. Protection from dust and dirt can be achieved by wearing suitable glasses although there is the risk of wind-blown dust and dirt entering the eye. Eating and especially drinking, can be rather awkward with Bell's palsy. The only effective method of ensuring that the food / liquid remains in the mouth is to physically hold the affected corner of the mouth closed by holding both lips between thumb and forefinger on the affected side. It may not be particularly attractive or graceful but it is better than wearing what you were trying to eat or drink! J. M. K. Murthy and Amrit B. Saxena. Bell's palsy: Treatment guidelines. Ann Indian Acad Neurol. Jul 2011; 14(Suppl1): S70–S72. Baugh RF, Basura GJ et al. Clinical practice guideline: Bell's palsy. Otolaryngol Head Neck Surg. 2013 Nov;149(3 Suppl):S1-27. Pes anserine bursitis (tendinitis) involves inflammation of the bursa at the insertion of the pes anserine tendons on the medial proximal tibia. Williams flexion exercises focus on placing the lumbar spine in a flexed position to reduce excessive lumbar lordotic stresses. Physical Therapist at Winner Regional Healthcare Center, South Dakota, USA. Former HOD Physiotherapy & Fitness center, NIMT Hospital, Greater Noida. Former Physio ISIC Hospital. MPT (neuro), MIAP, cert. manual therapist, Medical Neuroscience (USA). Licensed Physical Therapist in Texas & South Dakota, USA.